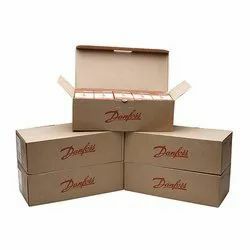 Danfoss oil nozzle programme consists of a wide range of oil spray systems as well as a series of special nozzles adapted for different market demands as regards operating area, media and emission. Each nozzle is tested 100 per cent electronically and visually for function and uniformity. Danfoss presents “a” and “od” programs of brass oil nozzles are well known for their accuracy, consistency and reliability when installed in even the most difficult combustion applications. 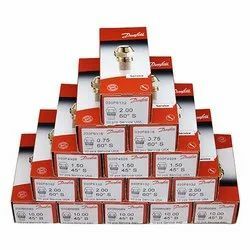 Danfoss nozzles are designed and manufactured to exacting standards, in accordance with en 293 and en 299 & they are interchangeable with other brass nozzles in the heating industry. Danfoss recommends to change the nozzle once a year out of consideration for environment and operating performance. • Monel filter Up to 12 usgal/h. Larger capacities without filter. 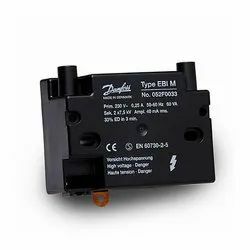 Classic enterprises, Mumbai Offers Danfoss Ignition Unit EBI4 series is a new generation of environmentally friendly ignition units for small and medium oil and gas burners. Danfoss Ignition Transformers EBI4 series is setting new standards within modern ignition units for oil and gas burners. Danfoss Ignition Transformers ensure optimum starting conditions for the burner. The EBI4 series is a new generation of environmentally friendly ignition units for small and medium size oil and gas burners. These series are for the intermittent ignition of oil and gas burners. Low weight and small dimension make the ebi series very suitable for use on modern compact burners as well as on more conventional burners. Low power consumption due to high efficiency. Different types are available in 1 or 2 pole ignition. up to 12 usgal/h. Larger capacities without filter. Danfoss make oil Burner Nozzles with competitive prices. Available sizes are:0.50 45 degree/ 60 degree/ 80 degree s0.75 45 degree/ 60 degree/ 80 degree s1.00 45 degree/ 60 degree/ 80 degree s1.25 45 degree/ 60 degree/ 80 degree s1.50 45 degree/ 60 degree/ 80 degree s1.75 45 degree/ 60 degree/ 80 degree s2.00 45 degree/ 60 degree/ 80 degree s/b2.25 45 degree/ 60 degree/ 80 degree s/b2.50 45 degree/ 60 degree/ 80 degree s/b3.00 45 degree/ 60 degree/ 80 degree s/b3.50 45 degree/ 60 degree/ 80 degree s/b4.00 45 degree/ 60 degree/ 80 degree s/b4.50 45 degree/ 60 degree/ 80 degree s/b5.00 45 degree/ 60 degree/ 80 degree s/b5.50 45 degree/ 60 degree/ 80 degree s/b6.00 45 degree/ 60 degree/ 80 degree s/b6.50 45 degree/ 60 degree/ 80 degree s/b7.00 45 degree/ 60 degree/ 80 degree s/b7.50 45 degree/ 60 degree/ 80 degree s/b8.00 45 degree/ 60 degree/ 80 degree s/b8.50 45 degree/ 60 degree/ 80 degree s/b9.00 45 degree/ 60 degree/ 80 degree s/b9.50 45 degree/ 60 degree/ 80 degree s/b10.00 45 degree/ 60 degree/ 80 degree s/b11.00 45 degree/ 60 degree/ 80 degree s/b12.00 45 degree/ 60 degree/ 80 degree s/b13.50 45 degree/ 60 degree/ 80 degree s/b15.00 45 degree/ 60 degree/ 80 degree s/b17.00 60 degree/ 80 degree s/b19.50 60 degree/ 80 degree s/b22.00 60 degree/ 80 degree s/b25.00 60 degree/ 80 degree s/b28.00 60 degree/ 80 degree s/b31.50 60 degree/ 80 degree s/b35.00 60 degree/ 80 degree s/b degree. Danfoss oil burner nozzles are used by burner manufacturers like Ecoflame, Bentone, Oilon, Weishaupt, Riello, FBR, Sookook, CIB unigas, Baltur, Lamborgini and other indian burners. Classic Enterprises, Mumbai Supplier of Bentone Burner Fuel Pumps and Other Spare Parts. Suntec Diesel burner pumps and Danfoss Oil Pumps are widely used on Bentone Burners. 12. Danfoss Burner oil Pump KSN Series Etc.